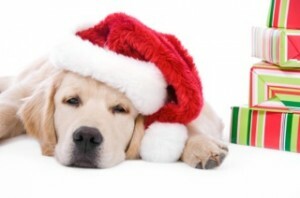 You are currently browsing the The Pet Product Guru blog archives for the day Sunday, December 9th, 2012. The holidays are here, there will be lots of family parties and dinners. Your dog will want to partake in all the the festivities. Giving your dog table food that he’s not used to is not a good idea. It could upset his stomach and he could swallow bones from the scraps. Instead stick with treats and bones from the pet store. A new toy to play with will always be welcome. Never give an animal alcohol. According to ASPCA.ORG , alcohol can be extremely dangerous and even deadly to an animal. After a party, make sure all empty bottles and glasses have been cleaned up before letting your pet roam the house freely. Make sure that your dog does not eat any chocolate. This can make him very sick and could be deadly if large quantities are consumed. Don’t let your dog roam the room during a party. Guests could slip him treats that are not good for him, he could eat food left out that could make him sick or he could slip outside if someone leaves the door open. Before the party, burn off you pets energy by taking him for a long walk. If possible, give him a chance to run around. This will tire him out and he may even prefer a nice quiet place to sleep during your holiday party.